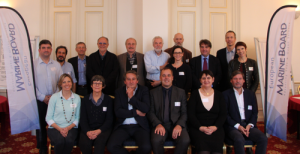 The European Marine Board Navigating the Future series provides regular pan-European summaries of the current status of marine research, priority recommendations and future scientific challenges in the context of European societal needs. Navigating the Future is a blueprint to guide both the research and the science policy agendas at European and national level. Since 2001, when the first Navigating the Future position paper was published, the series has been widely recognized, both by researchers and science policymakers, as providing critical periodic foresight and recommendations on emerging marine science topics and needs, as well as associated societal challenges and opportunities. The series receives wide praise as a comprehensive blueprint for seas and ocean research priorities. They are cited and used in scoping papers, reflection documents, strategy and advice documents, as well as scientific publications, and to inform funded work programmes. They are considered as key foresight reference documents for marine and maritime research priorities in Europe. Furthermore, they are cited as key references for national research policies. Navigating the Future V (NFV) will give a birds-eye big-picture view of marine science and will look into the future (2030 and beyond) to identify key topics/themes that are set to significantly advance our understanding of the marine and broader earth and climate systems. NFV will provide robust, independent scientific advice and expert opinion and be of increasing importance to societal wellbeing in decades to come. Navigating the Future V will be published on 11 June 2019 at EurOCEAN 2019. Navigating the Future IV (NFIV) was designed to inform the Commission calls under the Horizon 2020 programme. The document was organized around the framework of key societal challenges in the areas of climate, human health, food security, energy and safe and sustainable use of OKmarine space. NFIV also addressed strategic and enabling issues such as the European Ocean Observing System (EOOS), training, the science-policy interface and ocean literacy.